Continuing our expose of corruption within the Fiji First Government here's one about a former Attorney General and now Industry, Trade and Tourism Minister, providing false information in order to gain for himself. 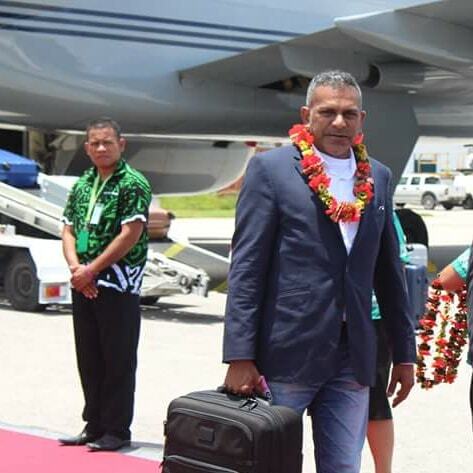 Documents obtained by C4.5 tonight reveal Fiji First Minister Faiyaz Koya falsely declared a higher salary on his application for a loan from the HFC - Home Finance Company Bank. The unscrupulous Faiyaz Koya is another puppet who dances to the tune of Frank Bainimarama and Aiyaz Sayed-Khaiyum, circumventing the system and breaking the law like his role models, for personal gain. He is a favourite of Frank Bainimarama's boys, with the dictator calling him Amitabh Bhachchan for his moves on the dance floor as well as sharing his cigarettes with the school dropout PM. In 2016 Bainimarama gave him additional portfolios of Lands and Mineral Resources, positions previously had by the reliable Mereseini Vuniwaqa. The documents show Mohamed Harun of HLB Crosbie & Associates, acting as Koya's accountants wrote to HFC saying Koya was on a salary of between $260,000 to $300,000. The letter was written on 29th September 2014, four days before the Bainimarama regime promulgated the last Decree before Parliament started on October 6th, paying the Ministers hefty salaries. But in the Decree the AG's salary was $235,000 while other Cabinet Ministers (except Health, Education, Infrastructure who were paid $200,000), were paid $185,000 per year. Koya falsely over-declared his salary by $75,000 to $115,000 to qualify for a larger loan. Within three days of his application, Koya obtained a loan of almost a $1 million. Which other ordinary customer, described as a politically exposed person according to the documents, would receive such a high amount of loan within three days? At the end of November 2015, 13 months later, Koya applied for a another loan against his salary and assets that suddenly accumulated to $885,000. His liabilities were shown at only $150,000. This is the way our nation has been run where the rules are different for the privileged few. And don't forget - this is after a military coup, that the regime says was a clean-up revolution to get rid of corruption! And this is the man representing Fiji at Pacific Islands Forum in Nauru. So if the puppet is rolling in what he reckons is rich filth, it is no wonder that Khaiyum has millions stashed away as revealed last week. And what is the Supervisor of Elections doing about this? Is he investigating the false declarations made by Koya and Khaiyum! Or is he on a witch hunt tormenting Opposition political figures? Watch this space as we reveal more corruption within Fiji First. And this is why the country isn't progressing as efficiently as it should, especially with the huge transparency flaw that's evident right here with FlipFlop Party running the country into the ground at the moment. Oh and did I mention the "vote-buying" tactic of developments and upgrades around the country that should have been done a long time ago...because government is pulling off fast ones yet putting half-arse effort into it instead of doing the projects thoroughly like the damn roads for instance.